Image courtesy of the National Archives and Records Administration H.R. 8687 was passed by the House of Representatives 274 to 111 (with 47 Members not voting). After hours of debate, the House initially passed the Reciprocal Trade Agreement Act by a vote of 274 to 111 (with 47 Members not voting)—for the first time granting the President its traditional power to levy tariffs. 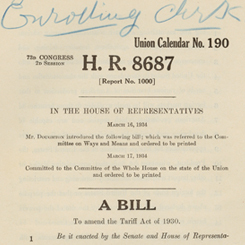 The act not only gave President Franklin D. Roosevelt the authority to adjust tariff rates, but also the power to negotiate bilateral trade agreements without receiving prior congressional approval. Advocates believed that granting these powers to the Roosevelt White House would help the administration quickly conclude agricultural trade agreements to speed recovery of the Depression-ravaged economy. Critics believed Congress had abdicated a key oversight function. Representative Allen Treadway of Massachusetts, Ranking Republican on the Ways and Means Committee, objected that “it would surrender the taxing power of Congress to the President and his subordinates in violation of both the letter and spirit of the Constitution.” Others thought the law might enable the President to forgive or postpone debt owed by a foreign country and undermine American industry. To assuage such concerns, the bill was amended with a three-year expiration date on all trade agreements.